'Star Wars: Darth Vader: Dark Lord of the Sith Vol. 4 Fortress Vader' review – AiPT! December 19, 2018 saw the release of Darth Vader: Dark Lord of the Sith #25: Fortress Vader, Part VII, and with it the end of both the series and Charles Soule’s run — which is indisputably one of the best runs in Star Wars comics history. If you missed it, not to worry. Marvel was nice enough to collect Soule’s run in four TPBs, the last of which just came out and contains the series’ epic conclusion. And that’s what we’re here to talk about today — Darth Vader: Dark Lord of the Sith Vol. 4. The first time I watched Luke Skywalker speak to Obi-Wan Kenobi about his father, I witnessed him learn a number of things that had been hidden from him, most notably that his father fought in the Clone Wars and was a former Jedi Knight. Yet what always stuck with me from this scene was the hidden truth in Obi-Wan’s words, the actions that Luke’s father took as both Anakin and Vader, and how Obi-Wan interwove them. One line in particular from that scene has continued to pop into my head again and again as I’ve read Soule’s run, and that goes double for this book, is “a young Jedi named Darth Vader, who was a pupil of mine until he turned to evil, helped the Empire hunt down and destroy the Jedi Knights. He betrayed and murdered your father.” Of course, a big part of this is because throughout this series we’ve watched Vader in the act of hunting down and murdering Jedi that survived Order 66. Which is exactly where Soule starts our journey here, alongside the Jedi hunting Inquisitors, and an abrupt twist that I doubt anyone saw coming. But that’s not the only event in which we see Vader’s betrayal of his former self manifesting. Emperor Palpatine does a masterful job of tormenting his apprentice while he instructs him in the dark side of The Force. Soule recognizes this and does an equally excellent job illustrating the role Palpatine’s cruelty and calculating nature play in his not-so-subtle act of erasing every last shred of Vader’s past life. Even when Palpatine is praising Vader and presenting him with a gift, there’s a piece of malice attached to it, a motivation beneath the surface. 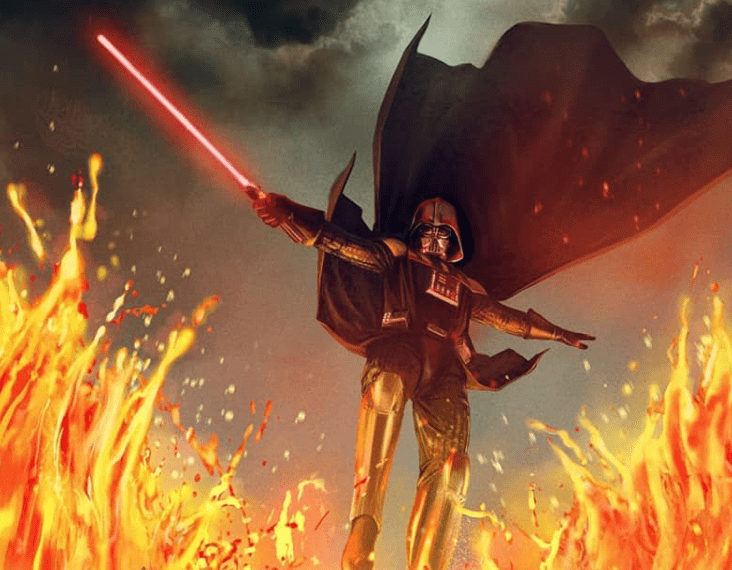 Vader’s master wants to stoke the flames of the newest Lord of the Sith’s rage, and his nostalgia-soaked gift does just that — leading to Vader’s wrathful destruction of one of the few remaining connections to his life as Anakin Skywalker. As a consequence of attempting to achieve his greater goal Vader throughout this story, Vader is forced to relive his entire life’s journey up until this point. He’s forced through a spiritual vision quest of sorts, beginning on the sands of Tatooine with his mother, to Coruscant and his first days in the Jedi temple, shifting to his first kiss with Padme, and finally his betrayal of the Jedi Order and transformation into Darth Vader. It’s during this that the reader with a clever eye will catch Soule’s nod to The Last Jedi and Kylo Ren. This simple yet powerful connection between the two characters opens a door that one could spend hours theory-crafting, and has a lot of exciting possibilities attached to it for the future of the Star Wars franchise — both in the comics and films. I can’t help but be incredibly impressed with Soule for taking a single sentence in a comic book and quite possibly changing the future of the franchise. I know that’s a bold claim, but I promise the implications are that big. To access the vision quest on the path to Vader’s ultimate goal, he must open a Force Locus in a secret chamber within the depths of Mustafar. It’s during this moment and the following sequence that we see artist Guiseppe Camuncoli display some of his most impressive work from the series, which I’ve shared for your enjoyment above. He draws a chamber that just oozes evil, with countless arcane Dark Side symbols covering the walls, and a miasma of bad feelings permeating the air. After forcing open the gateway, Vader’s spirit within The Force is pulled from his body and enters the Force Locus to experience a retelling of his tragic life story. Camuncoli gets really creative here with the appearance of Vader’s Force spirit, showcasing a creature of swirling red patterns with limbs that are noticeably see through, which correspond with the limbs Vader lost on his physical body. Speaking of Mustafar and the Force Locus, how did Vader come to this? While I won’t spoil everything for you, I can say that Soule introduces a new Sith Lord that up until now had been nonexistent in both Legends and current canon: Darth Momin. It’s through this new Sith Lord that Vader discovers the key to unlocking a Dark Side Force Locus that he discovered upon Mustafar during a previous visit to the scenic planet. With Momin comes a whole new chapter in the book of Sith lore, new information about The Force, and the story behind why Vader built his fortress on Mustafar. All in one trade paperback, no less. If that’s not a sign of Soule’s talent I don’t know what is. I have so much appreciation for a creator that builds upon and enriches the lore of the world they have to leave behind. Not only that, but when canon was reset the Star Wars franchise lost countless stories and characters from the last 40+ years — it’s so satisfying to me as a Star Wars historian of sorts when new characters join the franchise. Charles Soule and Guiseppe Camuncoli did an absolutely incredible job with their time on this comic book, and I couldn’t be more grateful. They took one of the most iconic characters in science fiction and treated him with all the respect, care, and love that he deserves. We got to watch him interact with several legends from the Star Wars universe, we learned more about Sith lore, kyber crystals, the Inquisitors, and the brutal relationship between a Sith Master and his apprentice. And while witnessing Vader’s journey into the Force Locus will undoubtedly leave a lot of readers feeling that the end of the journey was inconclusive and is open to much debate, that isn’t inherently bad thing. Part of what makes this character so fascinating is the destruction he suffers at the hands of his own hubris. Before his fall we watch him shed love and honor in a desperate grasp at power to manipulate and control, but in betraying all that was good about himself, he ends up being the one manipulated. Vader relives that again, watching it happen, seeing the bad choices all over again and still makes the same choice. Soule has shown very clearly that this man isn’t a tragic fallen Jedi looking for help. This is a Lord of the Sith. Charles Soule and Guiseppe Camuncoli did an absolutely incredible job with their time on this comic book, and I couldn't be more grateful. They took one of the most iconic characters in science fiction and treated him with all the respect, care, and love that he deserves. Stormtroopers fighting giant fleas on an ocean of lava. Take a deep dive into Vader's psyche. Ridiculously cool artwork from Guiseppe Camuncoli. Watch Vader and the Inquisitors hunt down a Jedi that survived Order 66. Vader's journey in the Force Locus may leave a lot of readers feeling unsatisfied.